BEIJING—China has executed two Uighurs and sentenced another 15 to jail for alleged terrorist links, Radio Free Asia said in a report just days after Beijing warned of “attacks” aimed at the Olympics. The Kashgar Intermediate People's Court sentenced two men–Mukhtar Setiwaldi and Abduweli Imin–to death and immediately executed them after a July 9 public trial in Yengi Sheher county, said RFA, citing local Xinjiang, Uighur and official sources. 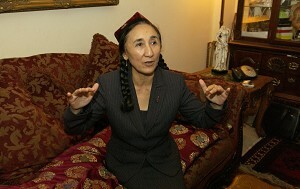 “Uighur men, women and children in East Turkestan continue to live under an extremely brutal form of repression,” said UAA President Rebiya Kadeer. “They live in a state of constant fear that they will become victims of state violence,” said Kadeer. China said on Thursday it had foiled five “terrorism groups” plotting attacks on the Olympics, and in the first six months of the year, police detained 82 people in the restive far western Xinjiang region for allegedly plotting to sabotage the Games. A day earlier, state media said police had shot and killed five people seeking “holy war” against the country's dominant Han Chinese. All 17 were accused of being members of the East Turkestan Islamic Movement, which Beijing says has ties to terrorists. The group denies the claims. The government says it has foiled a string of “terrorist” plots this year hatched from Xinjiang, a mainly Muslim region where Beijing accuses militant Uighurs of working with al Qaeda to bring about an independent state called East Turkestan. Many Uighurs resent the migration of Han Chinese to the region and government controls on their religion and culture. Uighur groups deny separatists are plotting attacks in Xinjiang and accuse China of a pre-Olympic security crackdown targeting activists seeking greater freedom for the region.